I’ve just added a new component to my HTML5 Web Components gallery. X-Gravatar is a custom tag, using Gravatar‘s REST API to display Gravatar profiles. 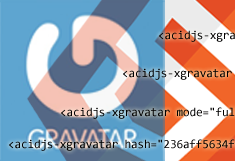 hash – Required username of the gravatar profile to show or MD5-hashed email of the user. You can create MD5 hashes here online. Examples: johnsmith or 14804fe005550d42595e1c2adb65c234. mode – Optional display mode of the component, one of the following "full" (default), "compact" or "minimal". width – Optional width of the component in pixels or percentage. Default: "100%". height – Optional height of the component in pixels Default: "auto". Have a great weekend, and don’t forget to check the demo on this page.